I understand that the special moment of walking down the aisle is incredibly important for any bride and that being comfortable in your dress is crucial. With my wedding and bridal dress alterations I will help deal with your concerns. Given the wealth of wedding dress styles and designs that are available, it is impossible to provision generic prices for alterations and remodels. However, to provide rough guidance, I have created a sample price list. Each of my customers receives a personal service and quality end result. Take a look at my gallery to view my previous work or find my page on Facebook for up-to-date information. Contact me, in Farnborough, Hampshire, by email to acquire more information about my Bridal Dress Alteration services. 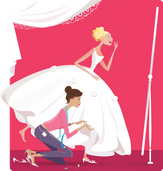 I am independent Bridal Seamstress who specialises in wedding dress adjustments. Working from my home in Farnborough, Hampshire, I provide professional dressmaking services. With many years of experience working with local Bridal Boutiques, I take great pride in my work and offer each client a special, personalised treatment. Contact me about my alteration services today. It is wise to plan ahead for your alterations. Please note that there is often a wait of several weeks for a first fitting appointment. Please feel free to leave me a review on my Google page. MY DIARY IS BUSY AND THERE IS A MINIMUM 3-5 WEEK WAIT FOR A FIRST APPOINTMENT. SATURDAYS ARE ESPECIALLY BUSY.